(October 05, 2012) Families resettled by Cambodia’s railway rehabilitation project filed a complaint today with the Australian Human Rights Commission (AHRC) alleging that they have suffered serious violations of their human rights as a result of resettlement under the project, which is partly funded through a grant from AusAID. 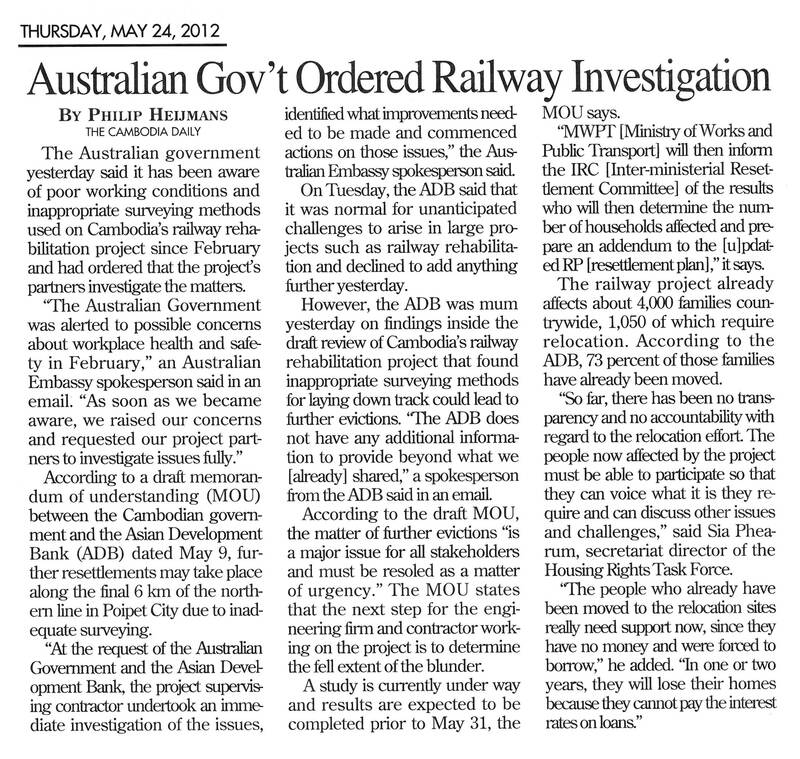 The complaint, which was jointly submitted on behalf of 30 affected families by Equitable Cambodia (EC) and Inclusive Development International (IDI), claims that the Australian Government failed to uphold its international human rights obligations by providing significant funding to the railway project without taking sufficient measures to safeguard against breaches of human rights. The Railway project, financed mainly by loans from the Asian Development Bank (ADB) and grants from the Government of Australia, affects at least 4164 families who live alongside the dilapidated railway tracks. At least 1200 families are required to relocate in order to make way for the project. A joint venture of the Australian firm Toll Holdings and the Cambodian firm Royal Group secured a 30-year concession to operate the refurbished railways. The complaint focuses largely on breaches of the International Convention on the Rights of the Child, as children in particular are bearing the brunt of displacement. The complaint quotes a mother of three who says that she no longer has enough money to feed her children three meals a day and send them to school, so two out of three have dropped out. One daughter now works at a factory and the other stays home and helps her cook and clean. She says that her children were not often sick before resettlement and are now “always sick” with headaches because they are hungry. The complaint claims that health and safety failures of the resettlement process have had fatal consequences for children. Most notoriously, in May 2010 two children drowned in a pond four days after their families were relocated to a Battambang resettlement site without any water supply. The pond adjoining a nearby rice field was the main water source available to the families at the time. In November 2011, two children were hit by a truck while they were walking back from school to the Poipet resettlement site. One child died and the other sustained serious injuries. No school was provided at the resettlement site as the families were promised, so children have been forced to walk 4 km and cross a busy road to get to their old school. ‘These human rights violations were highly foreseeable and could have been avoided,” said IDI Legal Associate Natalie Bugalski. “When Australia decided to act outside of its borders by providing significant financing to the railway rehabilitation, AusAID became obliged to take measures to ensure, to the best of its ability, that the human rights of those to be affected would be respected. While the Government of Cambodia bears the primary responsibility to ensure respect for the human rights of project-affected people, AusAID is also partly liable for the human rights violations suffered,” she added. 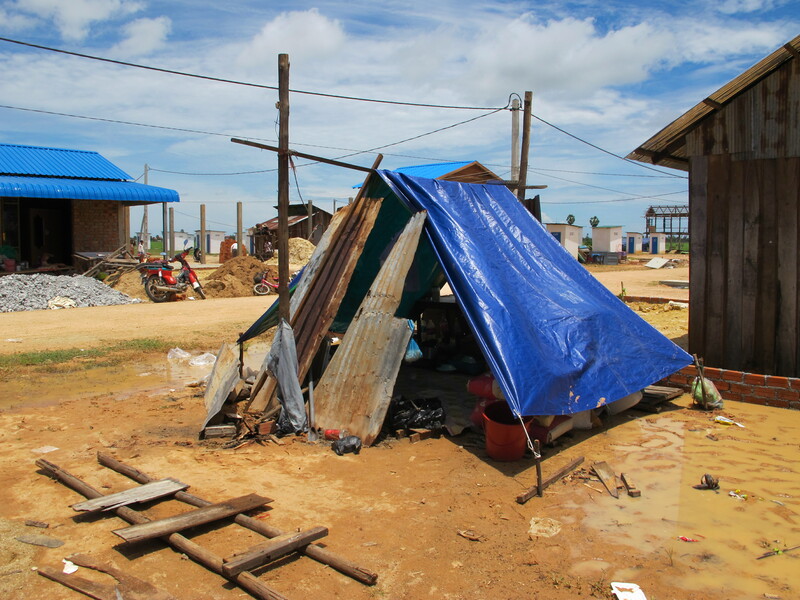 “Resettlement should be a chance for development for affected people,” stated Eang Vuthy. “They should be active participants in the project and it should make their lives better off. They certainly shouldn’t drag people into poverty and exploitation. We need a win-win approach,” he explained. The complainants have requested a number of remedies from AusAID, together with ADB and the Cambodian Government, including debt relief, compensation for their lost income and support to meet the basic needs of their children. In addition to the direct reparations for breaches of human rights of affected persons, the complaint calls upon AusAID to adopt human rights safeguard policies and practices including a requirement to conduct human rights impact assessments for all projects to which it is considering providing support. “We are calling on the Government to adopt a human rights based approach to international development,” said Rachel Ball of the Human Rights Law Centre, which assisted with the complaint. “Incorporating human rights into the development and delivery of aid programs is central to aid effectiveness and can prevent large scale violations such as those associated with the railways project,” she said. Facts and Figures #20, entitled Railways Relocation in Phnom Penh: Six Women Tell Their Stories, was published by local urban NGO Sahmakum Teang Tnaut on Apr. 2. Featuring the direct narratives of six elderly women, many of them widows, relocated from their homes along Phnom Penh’s railway tracks to Trapeang Anchang relocation site some 20-25km away, the publication begs the question of whether the ADB’s assurances that all sites are equipped with basic services and an income-restoration programme is provided ahead of relocation really holds true. You can access the publication here: FF20_Railways Relocation in PP. An NGO has criticised a controversial railway rehabilitation project – funded primarily by the Asian Development Bank and AusAID – in a report that states the US$143 million project has left families at risk of impoverishment by failing to adequately compensate and resettle them. In the report obtained by the Post, Bridges Across Borders Cambodia says a perception among many families interviewed that they had been, or would be, worse off because of the project was “unsurprising”. “The lack of meaningful consultat-ion, including the provision of genuine choices from the beginning, has meant the resettlement process has been fraught with problems for many households,” the report says. More than 4,000 families living alongside the railway could be affec-ted by the project, and at least 1,200 families will have to relocate. BABC executive director David Pred said that although there had been recent improvements, including a partial refund of electricity fees for resettled families in Phnom Penh and allocation of plots to people previously denied them, problems with the resettlement process remained. “The most serious systemic problem of inadequate compensation and loss of income leading families into debt has not been addressed, and it poses the greatest risk of impoverishing affected people,” Pred said. More than a third of the households interviewed felt they had been “intimidated or coerced, mainly by local authorities”, and NGOs monitoring the project had come under “significant pressure”, he said. The report says the resettlement experience “was not uniform”. Fewer than 40 per cent of the more than 200 households interviewed between September, 2010 and October last year reported that living standards had improved or had not worsened, and development partners had made efforts to improve resettlement. However, there was a “systematic downgrading” of compensation for affected families, the report says. It states that for some, the five resettlement sites were too far from their original homes and none were adequately equipped when families relocated, with access to water and electricity costs of particular concern. “A considerable number of affected households have suffered harm and a deterioration of their living conditions due to non-compliance with the ADB Policy on Involuntary Resettlement,” the report says. It urges the government to halt resettlement until international rights obligations and ADB policies are adhered to, review compensation and ensure basic services at resettlement sites. Officials from the Ministry of Public Works and Transport were not available for comment yesterday. Interior Ministry spokesman Khieu Sopheak could not be reached, while Council of Ministers spokesman Phay Siphan said that he was “not aware” of what was occurring with the resettlement. Long Vanny, 53, who moved from Tuol Sangke village in Russei Keo district to Trapaing Anhchanh village in Dangkor district, is about US$1,000 in debt from building a house and opening a grocery shop. “I hope this relocation and my business will help support my living better, although I owe money,” she said. She has received a larger plot of land with water, electricity and toilets and more than $900, but is far from schools and health centres. Relocated households would receive land titles after five years and electricity, water supply and basic facilities were being implemented, it said. An Australian embassy spokesperson said improvements had been made at resettlement sites, compensation and grievances processes. The Australian embassy has defended its involvement in a rail development project in Cambodia, which critics say is increasing poverty among those displaced from the side of the tracks. The Rail Rehabilitation Project will spend more than $US140 million fixing Cambodia’s two decrepit rail lines, which link Phnom Penh with a southern port and the Thai border to the west. 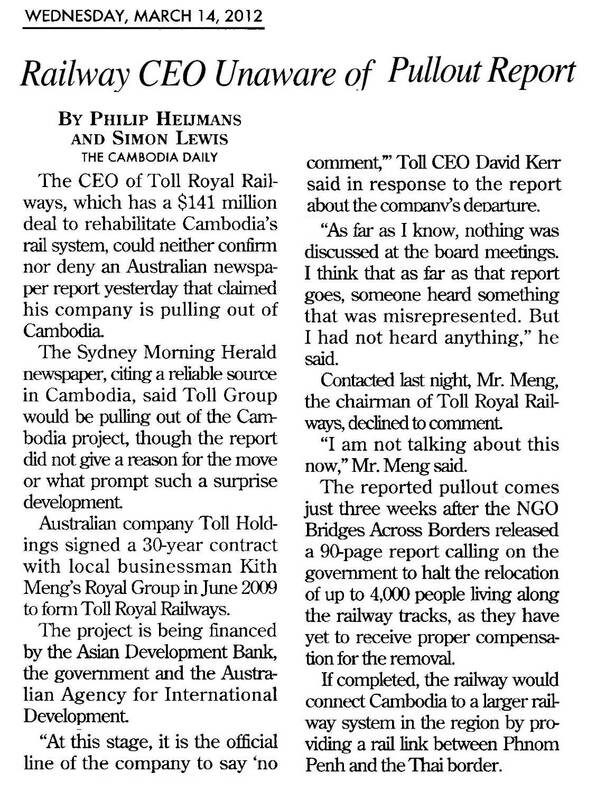 It’s billed as a poverty reduction scheme, and an Australian company Toll Holdings has teamed up with Cambodian conglomerate The Royal Group to run the rail service. RICHARDS: Well this fits very strongly with the Cambodian government’s own economic planning and objectives and fits in with the ASEAN masterplan of connectivity. Economic theorists will tell you the best way to develop economies and therefore bring people out of poverty is to link up trade routes and trade networks. So the railway will link up Cambodia’s garment producers, manufacturers, farmers, agricultural producers with prospective markets in Thailand and ultimately other parts of the wealthy ASEAN market. So through infrastructure connectivity, economic development that will increase the growth rates in Cambodia, help reduce poverty rates and give opportunities for individual Cambodians. COCHRANE: In the course of this project, Australia has made commitments to making sure the resettlement process is carried out appropriately and has said that assisting displaced people and replacing their housing, land, livelihood and access to services has helped offset any negative impacts. However, at the moment, residents relocated 25 kilometres out of the city are sleeping under tarpaulins and the promised income support initiatives, that were pledged and that Australia has put a million dollars towards has not yet started, even though they’ve already been relocated. Is this an acceptable situation for those people who have been moved? RICHARDS: As you mentioned, the project is mainly funded by the Asian Development Bank with Australia as a co-funder. Under the terms of the loan agreement, the Cambodian government is responsible for the resettlement project and has agreed to do resettlement in accordance with the ADB safeguards policy. The fundamental principle of that policy is that those who are moved off land where they’ve been illegally squatting should be no worse off than they were before. There’s various elements to that no worse off policy. People will be compensated for their assets which they’ve left behind, the areas to which they’re moved will have electricity and running water, which, of course, is you can’t take for granted anywhere in the Cambodian countryside, which only has 20 per cent electrification, a mentioned, income restoration projects, that’s part of it, because one reason why people like to live in these dangerous areas so close to transport corridors is that there’s a means of small commerce with passing trade, so income restoration is important. As you point out, the project has not been trouble free, but I think everyone recognises it’s a complex and heavy burden that the Cambodian government’s undertaking and our objective has been to shore up its capacity, assist with resources for extra monitoring and giving a hand where we can, so that not only this project with resettlement works well, but that there’s some residual capacity in the Cambodian government which we hope it might apply in other projects which we’re not necessarily funding. So there will be hiccups along the way and, for example, one of the issues which has been discussed is grievances, is the amount of compensation adjusted correctly and so on and that’s another area where we’ve been concentrating, helping to get the grievance resolution process working better and I’m informed that as at the current time about 60-70 per cent of grievances have been addressed. COCHRANE: You mentioned the focus on monitoring for this project and I understand at least half-a-million dollars has been put into monitoring, independently evaluating the success, the socio-economic impact of this rail development project. Another key part of that monitoring is something that AusAID has recognised is the contribution of non-government organisations which brings us to one of the organisations STT, one of the two main groups involved in the rail project. It was recently suspended by the Cambodian government shortly after they called for a halt to the resettlements. Will Australia consider pulling out of this project if NGOs like STT are not allowed to monitor the resettlement process? RICHARDS: Well, a couple of things to say on that. First of all as a general principle Australia values very much the role of civil society, both in our own country and in other countries where we work and we always make the general point that civil society has an important contribution which it can make in relation to this particular project. The issues which some of the NGOs have raised are serious and have merited attention and indeed we have redoubled our efforts to address some of these problems which have cropped up. In terms of the project, we talked before about the overall aims of poverty reduction and we believe that in partnership with the ADB and the Cambodian government we should forge ahead with this project whilst addressing in a careful and thorough way the problems which arise along the way. COCHRANE: One of the key methods of finding out the problems that are arising along the way though has been through this group STT. Will Australia consider pulling out of the project if the group is not allowed to continue monitoring? RICHARDS: The Australian government remains committed to the project for the important policy objectives which I’ve mentioned.